French President Emmanuel Macron arrived this afternoon at the Presidential Palace in Nicosia where he will hold official consultations with President of Cyprus Nicos Anastasiades. The focus of the meeting will be energy issues and co-operation in the field of security. They will also discuss other bilateral topics, as well as the Cyprus problem. In addition, Cyprus will ask for France`s support in view of the decision in October regarding the seat of the European Labour Authority. 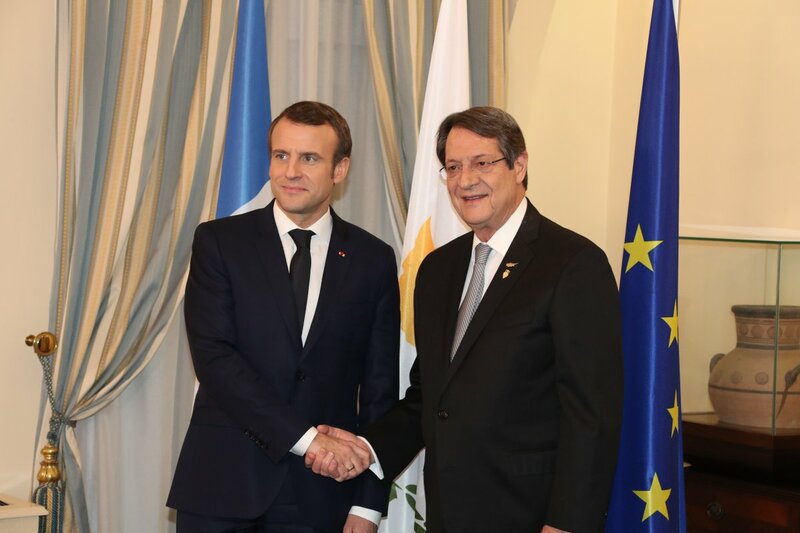 According to CNA sources, the official meeting between President of Cyprus Nicos Anastasiades and French President Emmanuel Macron takes place in the framework of the ongoing contacts between the two countries, both at the level of the two Presidents and at ministerial level. It is noted that the deliberations between the two states are underway for some time now. The two sides are working on closer cooperation and possible agreements on energy and security. Present at the meeting are, on behalf of Cyprus, Foreign Minister Nikos Christodoulides, Energy Minister Yiorgos Lakkotrypis, Minister of Defence Savvas Aggelides and Government Spokesman Prodromos Prodromou, while the French Minister is accompanied by a delegation from the presidency. After the meeting, the two Presidents will leave for the Filoxenia Conference Center to participate in the 5th Southern EU Countries Summit that will begin later in the afternoon in Nicosia. The Summit will discuss the major challenges which the EU currently faces, such as migration, Brexit, energy security, the 2021-2027 Multiannual Financial Framework, developments in the Eurozone and climate change.